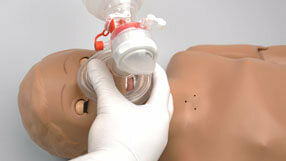 This simulator of a one-year-old child is ideal for training in standard and advanced clinical care procedures. The childlike face, body, and fully jointed elbows and knees permit the student and teacher to truly simulate authentic nursing care and medical treatment of the one-year-old child. Bilateral lung expansion with realistic chest rise during BVM. Realistic urethral passage and bladder for catheterization. 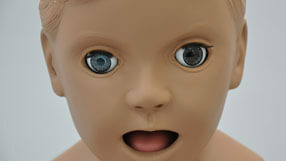 Eyes open and close, 1 pupil is dilated for ophthalmic. 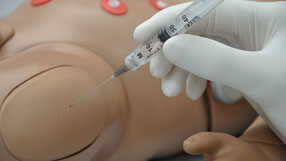 You will be able to practice intramuscular injections. You will be able to experience manual palpable pulses. 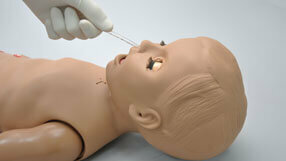 Nasal passage permits placement of NP tube. You can practice trachea placement. Size: 35" x 16" 10"